Made you look, didn’t I? 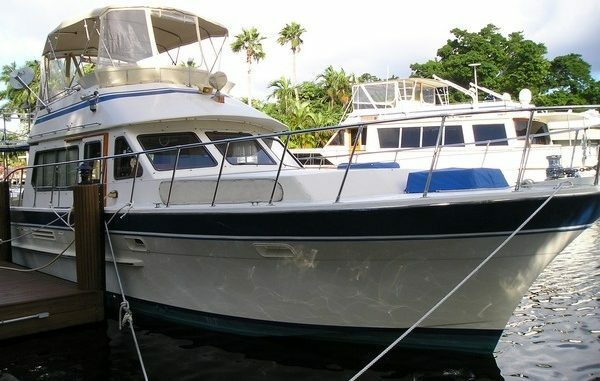 This boat was purchased by an Aussie through a local broker. It was to be delivered to Port Everglades for deck freight shipment aboard a freighter to Austrilia. 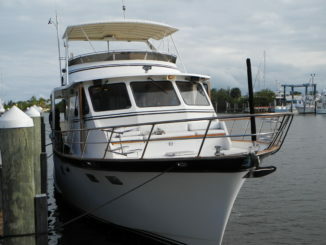 After the new owner closed the deal we were asked to prepare the boat for the 100 mile trip to Port Everglades, FL. There it would be placed aboard a ship headed for the South Pacific and the 900 mile cruise from the ship delivery port to the new owners hometown. 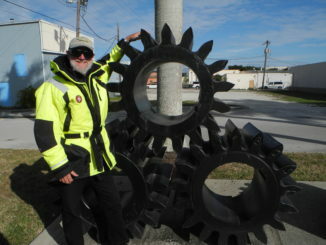 We prepared it for the short run down to the port in Fort Lauderdale and also for her journey aboard a ship. The freon had to be legally discharged from the air conditioners. This was an Australian requirement. 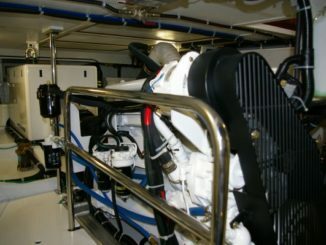 Some rubber hoses, bilge pump float switches & running light bulbs had to be replaced to bring her back to running condition. Then a spare parts inventory was created for the new owner in case he needed something during his 900 mile trip home. Preparing the boat for deck freight required removing ALL ITEMS from the outside of the basic boat including the dinghy. Our run to Port Everglades was in the ICW because of heavy seas in the ocean. First night stop was in Riveria Beach (western side of Lake Worth – Palm Beach). This was an easy run with few bridges to open. The marina is convenient to the Lake Worth Inlet and has a great Tiki Bar Restaurant. Next morning we headed down the ICW, slowed considerably by more bridge openings than we cared to count. But waiting for bridges sure beats the rough ocean. We arrived that afternoon at the pre arranged private dock for the export agent to accept the boat from us. A few more last minute items to tuck away in preparation for her long ocean voyage and we were ready to go. After the formal handing over of the boat we rented a car and drove home to Fort Pierce.